Sustainability and carbon footprint are becoming a major driver and concern for the luxury packaging market. 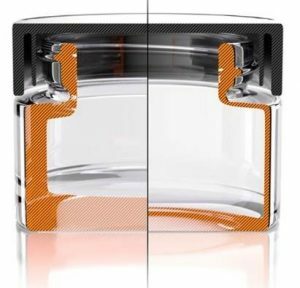 The challenge is to drastically reduce glass weight of luxury cosmetics jars in order to cut the impact on the environment, raw materials, manufacturing and transport. Bormioli Luigi has developed an innovative press-blow glass forming technique to reduce wall and bottom glass thickness to reach half of the weight of a jar of equal capacity. equivalent conventional glass jar. Moreover, Ecojars’s external dimensions are lowered by 40% which results in a reduction of the environmental impact and costs for transport all along the supply chain from the glassworks to the final customer.